Tommy Trainer is an aspiring actor, and has been for most of his life. Struggling to support himself, he plays the club circuits and accepts the bit parts while he waits for the big breakthrough. When his chance finally comes to play opposite one of England's top actors, Tommy's life takes a turn that is more real and dramatic than any script. A dead man is discovered at the bottom of a garden. At first it looks as if he has been hit by a train. But no train has run along those tracks in years... unless it is a ghost train! The marriage of Marsha and Richard is on the rocks. He is a successful actor, she, a dedicated modern teacher and mother. When they establish new relationships, she with Courtney, the school's Head, and he with his producer's wife, all is not well. Courtney sells out, and the producer's wife has Richard sacked from the series. 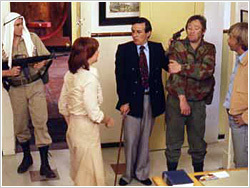 Richard tries to reestablish his position with his family. This is not without problems but Richard's final heroics earn Marsha's renewed love. Jill and husband Brian are academics living on campus. Jill works on her thesis at home, when one morning she opens the door to the plumber. She is puzzled. There is nothing wrong with their plumbing. The plumber thinks differently and begins to take their bathroom apart searching for an elusive fault. What follows is five days of hell and mental torment for Jill that will change her life, and the plumber's. She opened her door to a nightmare. An industrial chemist, involved in high security research, suspects his wife of infidelity. But she also has her suspicions. In devious attempts to outwit each other, and gain the upper hand, they discover the shocking and unexpected truth- leading them into a nightmare that changes their lives. Ernie Jenkins farms in the back country, where he lives in the old family home with his spinster cousin, Toddy. When Ernie's brother, Milton dies, his widow, Myra decides to come to Australia on a 'widow's pilgrimage'. Her arrival significantly disrupts the even rhythm of Ernie's life. A widow's attempts to begin life again, the humorous side as well as the poignant. A private investigator is hired by an insurance company to recover a strongbox hidden by a prison escapee in a remote timber town. A group of schoolchildren turn a ghost town into a weekend holiday camp for city children to save an old man from being evicted from his property. 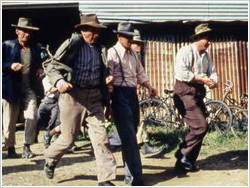 Drama set in an Australian town in the 1930's about a hunt for a murder suspect. The hunters are men, mainly brickworkers, from the town. The suspect is an itinerant Polish farmworker. although his pursuers barely know him, they are convinced he is guilty of killing a woman on an isolated farm. As the hunt progresses one of the hunters increasingly identifies with the hunted — he too is different. This story is an exploration of relationships between men and women... and of the hatreds that keep men apart.